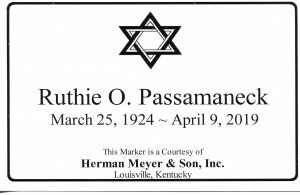 Ruthie O. Passamaneck, 95 – Herman Meyer and Son, Inc.
Ruthie Osoffsky Passamaneck, 95, beloved mother, grandmother and great-grandmother, passed away on April 9, 2019. She was preceded in death by her husband, Marvin Passamaneck; her parents, Hanna and Harris Osoffsky; and her brothers, Samuel and Ben Osoffsky. She is survived by her son and daughter-in-law, Howard and Ruth Passamaneck; her grandson Neal Passamaneck and his wife Angela Erwin and her great-grandsons Isaac and Grant Passamaneck. Also, left to cherish her memory are sisters-in-laws Sylvia and Doris Osoffsky; many loving nieces and nephews, and friends including: Toni, Ralph and Jennifer. She was active in her community and was a member of Temple Shalom, Congregation Ashei Sfard, Hadassah, and JCC, where she helped with lunches, dues and bingo. We are grateful to the staff of the JCC. Ruthie and Sylvia worked at Adath Jeshurun for over 24 years. They, also, catered with the help of family, Sheila, Danielle, Hedley, Dana and Samuel. It was a great time for all! One of her favorite songs was My Yiddishe Momme. She loved people and had a great smile. Ruthie’s motto was “I’m particular”. Woe to anyone, who did not understand the true ramifications of those words! From ensuring that the correct protocol was maintained in A.J.’s kitchen, to her special tuna salad for Super Sunday and her hand painted candies, Ruthie’s special touch was seen. She mastered catering for large parties to volunteering to bake and ice cupcakes with a Carmelite sister. Ruthie’s talents were many. We give special thanks to the staff, residents and volunteers at Nazareth Home –Clifton, where Ruthie lived for the last three years, for their exceptional care and loving friendships. They were extremely supportive of Ruthie and our family. Herman Meyer & Son, Inc.